One night, while Dalia slept safely wrapped in her mother’s cool silken sheets, her hair grew and grew. By the time the rooster crowed, her hair had “grown straight up to the sky, tall and thick as a Cuban royal palm tree.” Her mother was amazed, and wondered what her daughter would do with her wondrous hair. As Dalia looked at the flowers blooming in the garden, an idea sprouted inside her. She decorated her hair with leaves from the forest and mud from the marsh. Her mother was puzzled and could not imagine what she was. “Are you a leaf-crusted mud-tree?” she guessed incorrectly. That night, while Dalia slept safely cocooned in her mama’s sheets, something stirred and unfolded. When the rooster crowed, the girl ran outside and everyone watched in awe as she carefully unwrapped her towering hair. Could it be? Is Dalia a . . . blossoming butterfly tree?!? 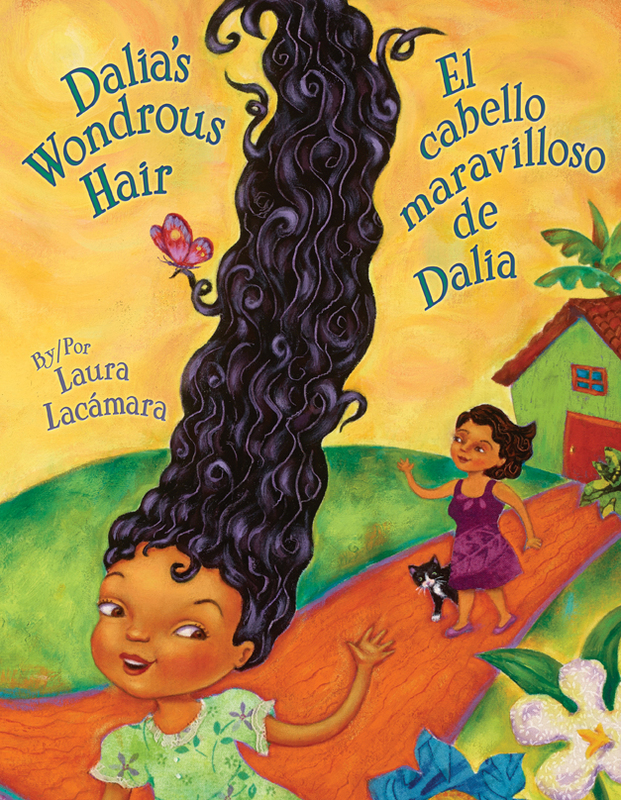 In this whimsical bilingual picture book, Dalia’s hair becomes a magical force of nature, a life-giving cocoon. Author and illustrator Laura Lacámara once again delights children ages 4-9 with her vibrant illustrations and an imaginative story about a girl’s fanciful encounters with nature. Bonus features include a guide for how to create your own butterfly garden at home, as well as a bilingual glossary of select plant and animal species native to the island of Cuba.